Aspirin sensitivity is due to hypersensitivity to the pharmacological effects of aspirin, a cyclooxygenase-1 or COX-1 inhibitor. Patients with this condition have impaired cyclooxygenase pathway and an overactivated 5-lipooxygenase. They produce high level of pro-inflammatory substances called leukotrienes when taking aspirin or other NSAID. Leukotrienes cause swelling of the skin resulting in hives and angioedema, swelling of nasal mucosa causing nasal polyps, and bronchoconstriction causing asthma. Thus, the name Samter's Triad comes from, and anti-leukotriene medications like Singulair® or Zyflo® are sometimes helpful in treating this condition. Those conditions are put into a group called Aspirin Exacerbated Respiratory Disease (AERD) or Samter's Triad. Patients with aspirin sensitivity can also have sensitivity to other NSAID class of medications like ibuprofen (Advil®, Motrin®...), naproxen (Aleve®, Naprosyn®...). Because it is not an allergic reaction, symptoms are dose dependent. The main problem of this condition is that AERD tends to be persistent even after stop taking aspirin and NSAID. Thus patients go through multiple sinus surgeries for polyps, complicated by fast growing back of nasal polyps, and suffer from hard to control asthma. 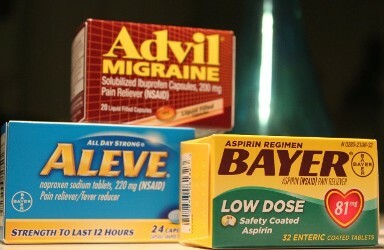 Treatment requires life-long aspirin desensitization. Up to 10% of patients with asthma and 40% of patients with both asthma and nasal polyps have aspirin / NSAID sensitivity. For more information, please visit Brigham and Woman's Hospital website about this disease.